I promised you some character makeup from the Red Bull Soap Box Race. 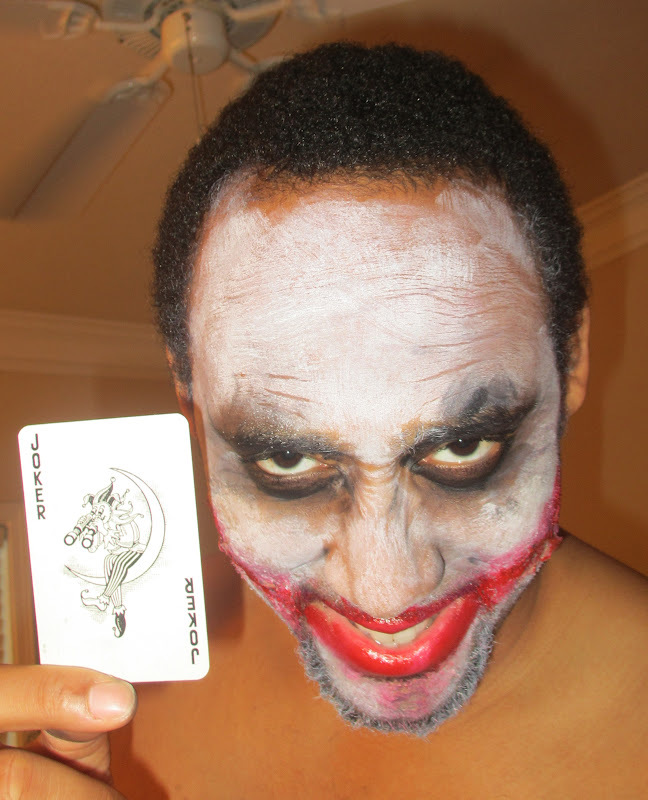 In this post, I show you the Joker look I did for my boyfriend. It's based on the Heath Ledger interpretation from the Dark Knight movie. First you'll see a test-run on me and then you'll see the final look on the boyfriend. 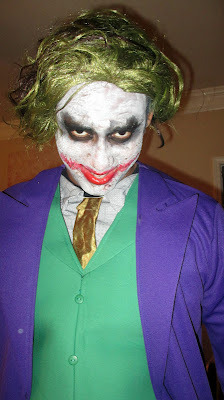 This and Halloween are the only times I'm allowed to ever put makeup on him lol. 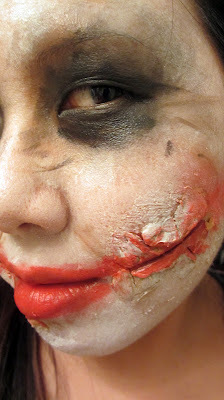 This makeup was actually pretty easy to do. There are a bunch of tutorials on YouTube such as via Petrilude and Kandee Johnson. I'd say that the key is to just go slow even though the makeup is "messy and distressed". Taking my time helped me control the makeup a bit more. To get the scars on the side of the face I first applied spirit gum to the cheeks. Next, I rolled on a bit of nose/scar wax with a spatula. With wet fingers, I smoothed the edges onto the skin and then I used my spatula to create the "cuts". This is a great picture of Heath Ledger's makeup before the paint and it helped me know where to place the scars. From there, I put on a layer of flexible wax seal (optional) and then a layer of liquid latex to add another layer of hold since the wax can be liable to peel off if you're not careful. After that, I proceeded to paint the face using white and black water-activated cake makeup from Mehron. I threw in some other random makeup products such as black liner, setting power and red lipstick. It's up to you on the little details...I used ripped up sponges, q-tips and painted in some crease lines to distress the look. I did a practice run on me first. Then I did a practice run on my boyfriend. I learned that this look definitely doesn't work with facial hair so he had to shave it off! Then here is the final look the day of the race! By the end of the day, all his sweating made the look even crazier which is a good thing in this case, lol. You can also see more actual pics of the event here. 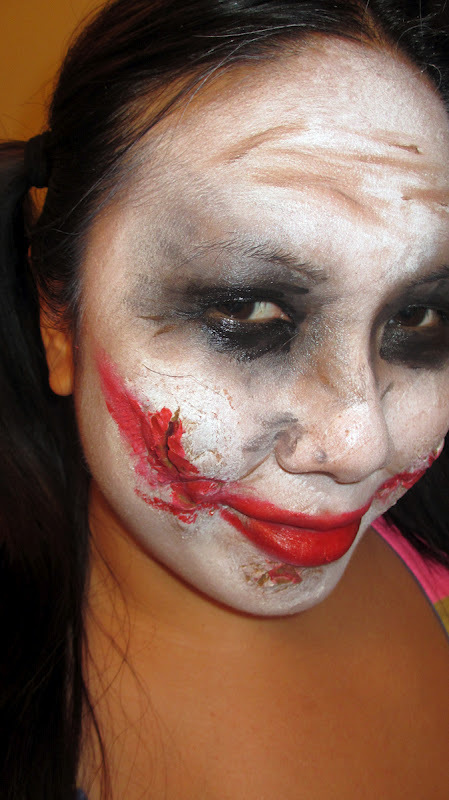 Next I'll show you the Harley Quinn look I did on myself. For those of you who don't know, that's Joker's girlfriend. I really like how it came out. 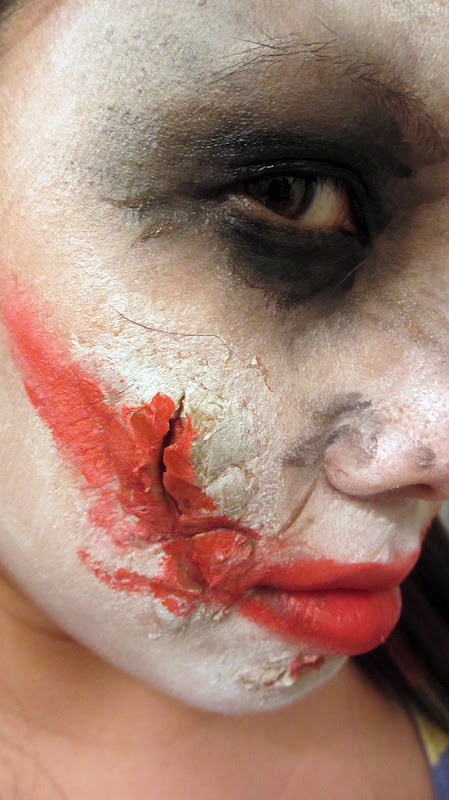 I'm thinking of re-doing it for a Halloween tutorial. 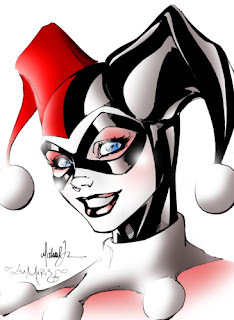 Can't wait to see the Harley Quinn look!